I like winter because I can stay indoors without feeling guilty. This winter hasn't been overly difficult. We've had cold temperatures but we've also had unseasonably warm spells. We've had significant snowfalls but also long periods of rain to do away with the evil white stuff. As some significant snow has fallen over much of the eastern United States and much of Ontario, as I post this, I can still see the grass but snow has begun falling in the last hour. Over the winter, many days were great for being outdoors but some of them lent themselves to enjoying the comfort of indoors. This post is about the latter. 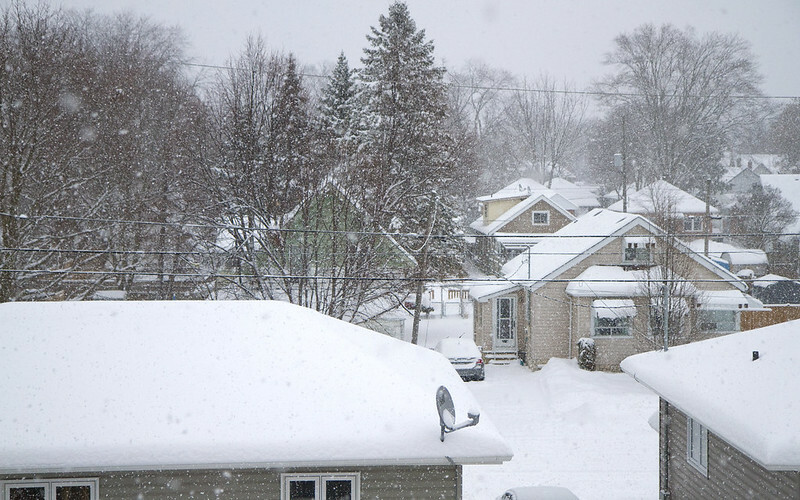 More than a few times, this was how the world looked outside my apartment window this winter. This was one of the bigger snowfalls we had - just a couple of weeks ago but it's long gone now. It looked a lot prettier from up here than it did whilst trying to drive through it in the pre-shoveled parking lot. It was the kind of day which lent itself to cozying up together in bed. 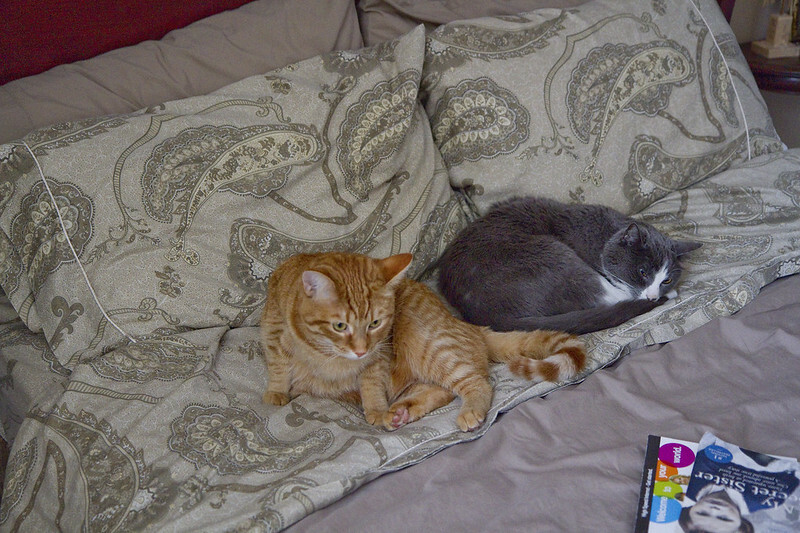 The grey and white guy on the right is my Zephyr and the orange tabby is Oliver who belongs to my neighbour, Carol across the hall. He never hesitates to take advantage of an open door opportunity. If both Carol's and my doors are open, he bolts into my apartment and makes himself comfy. Zephyr doesn't seem to mind too much.. anymore. In February, I had the great enjoyment of listening to my cousin Judith lecture and perform at Trent University. 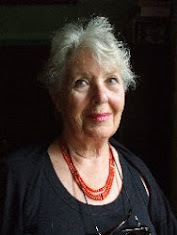 She's an Ethnomusicologist, and a very entertaining speaker who engaged her intimate audience with stories about Spain's Medieval musical history in the Catholic, Jewish and Muslim cultures. I realize that sounds rather specific, particular and possibly a tad dry but I assure you that it was anything but. My friends Carol Anne, Dakshina and I enjoyed the evening greatly. 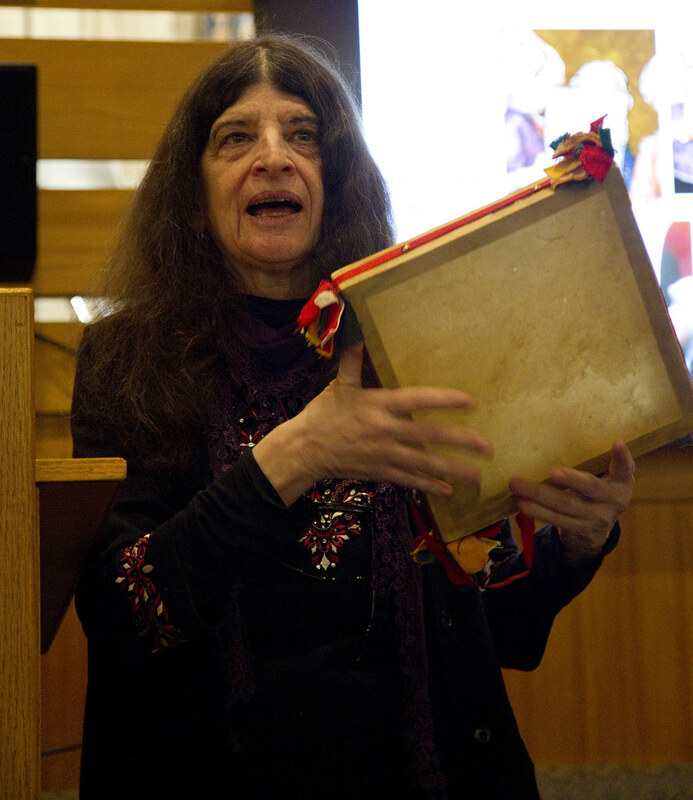 Here, Judith is singing and demonstrating a style of tambourine. It was great to be able to spend time with my cousin during her first trip to Peterborough. She came by for dinner the following day before she had to head back to Toronto. 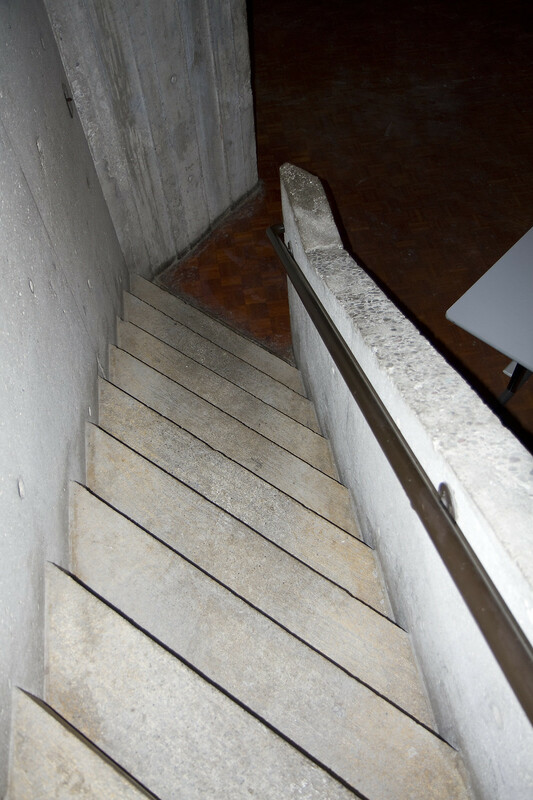 This vertigo-inducing staircase was the way up to washroom. It was as narrow and angular as it appears when looking down. Maybe even more so. The weather really doesn't quite know what to do with itself, this winter. On this night, we had rain which eventually froze over to leave this interesting pattern on my window. A couple of nights after the lecture, Carol Anne and I attended a performance at Market Hall in downtown Peterborough. Here are five of this group of seven (usually eight but one was recovering from an injury) which forms a dance company called Bboyizm. 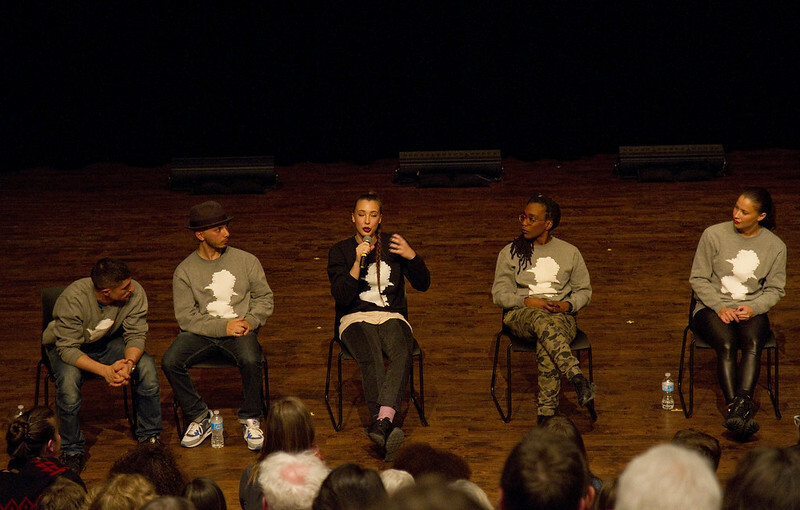 They "promote and preserve the foundation, authenticity and true essence of all street dances." We weren't permitted to take photos during their performance but were allowed to do so afterward, during their very interesting and informative question and answer period. The man speaking is the Artistic Director/Choreographer/Founder and dancer, Yvon Soglo aka Crazy Smooth. 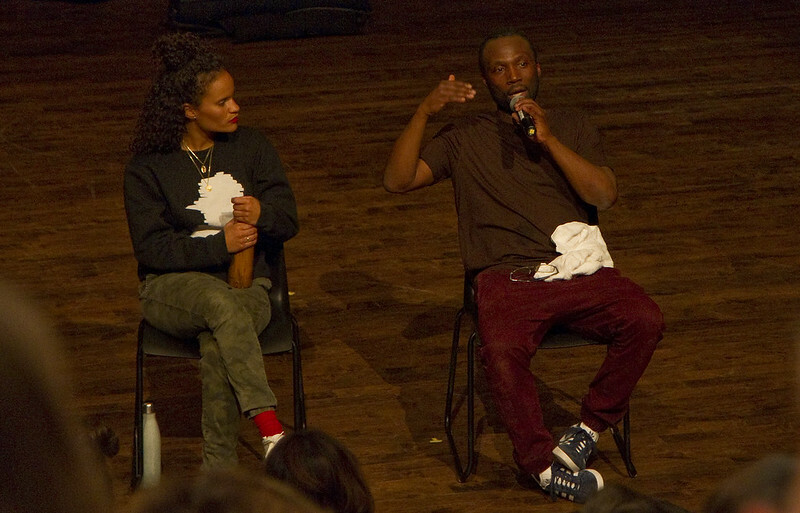 From the program: "He has come to be known as one of Canada's top street dancers and the first "b-boy" to obtain a Canada Council grant to pursue and hone his art. He has studied with some of the top street dancers in New York, Philadelphia and Orlando. He has also coached acrobats at Cirque de Soleil and performed, taught and judged at events throughout North America and Europe. He has also facilitated projects and acted as advisor and received numerous prestigious awards." This very talented group from Gatineau (Quebec)/Ottawa (Ontario) has been together since 2004 and if you are given the opportunity to see them perform, I strongly advise you take it. I have no idea how some of the window had some liquid/melt and the rest had frost but it made for an interesting image. Back in January - the twentieth to be exact. This was an image I caught on my television screen during the inauguration. Her face and earrings expressed the sentiments of many and her mittens might have represented her Canadian roots. I like how the closeup caught that she forgot to peel the size sticker off of the mits. She wears a size small/medium or petite/medium en français. 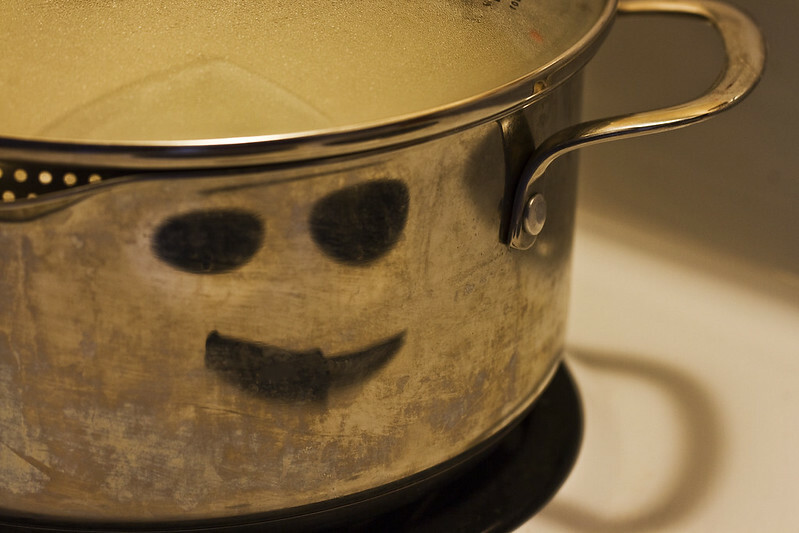 I had Carol Anne over for dinner one night and I had to laugh when I caught sight of the big smile on this pot of boiling potatoes. The face reflected in the curve of the pot was actually the two empty burners and a paring knife resting on the surface of the stove. What a happy cooking utensil. 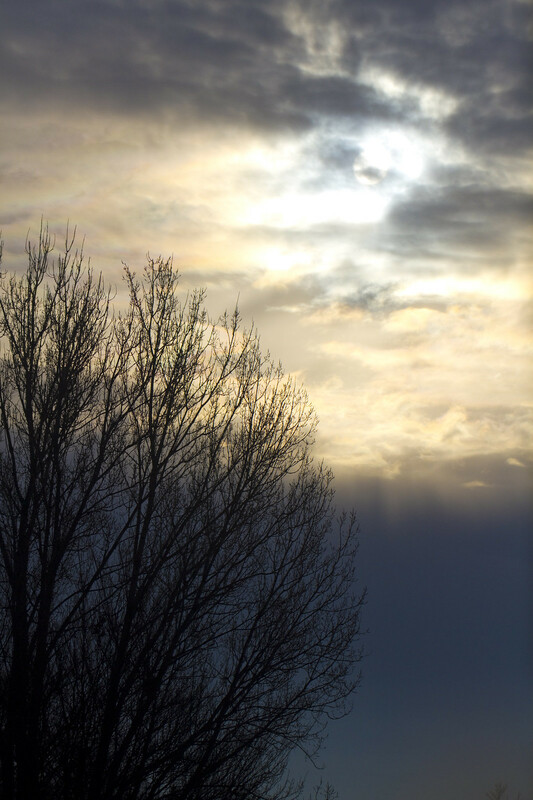 I took this photo because I liked the colours that came out in the lighter clouds over to the left, above the tree. I bumped up the vibrancy a bit on this one so that you could see the subtle but colourful effect. It made for a pretty sky as seen from the great indoors. Labels: Bboyizm, Crazy Smooth, cuddly cats, Dr. Judith Cohen, Ethnomusicologist, frosty window patterns, Medieval music, pareidolia, snowy Peterborough. I cry everyday I get up and the Cheeto is still in office. Beautiful photos, love seeing the two cats. Glad the Mr. Z has got a friend. The moody sky is formidable, and the kitties are sweeties! You can take in some interesting lectures and performances there. How wonderful! I love the moody yet spiritual vibe of that last picture. Fabulous and formidable photos! While snow is an amazing icy artform, we are glad to be here in So. California, where today's temp will be 89 deg. I can do without that temp. You find artistic views indoors and out! The smiling potato pot was magnificent. I love your pics, Hilary, and the way you weave them together. Peterborough has some many wonderful cultural events. I miss that. I have just read My Secret Sister and passed it to my sister. Interesting read. Sweet kitties. I wish mine would get over their hissy fit and get along. Beautiful images. i really like the frosty windows. Since I had windows replaced in my house,I don't see those frosty scenes any more. You've been having lots of fun this winter even the weather has been a challenge. I like the way you collect good photos and set them into a theme. Nice shots! I love the kitty cats especially! Winter is dragging on too long here! I admit I have no idea what street dancing is. I'm often disappointed in my pictures of the sunset that don't quite capture the subtle colors. So many wonderful and diverse photos, as usual! How awesome that your cousin came there to give a talk. It sounds very interesting to me! I've enjoyed all of your frosty window photos, and I'm not surprised you noticed the sticker on the gloves and the smily face on the side of the pot. Your photos definitely make me smile! Making the best of indoor times in winter. Hi ...I really took a long time to come over here and am stunned how beautifully you have still continued to see the world around you. Your pictures are motivational esp. the half melt and half frozen patterns on the window and how the pot looks smiling. Im glad you inspired me today! Wonderful shots. I love those Obama earrings. I do love your snowflakes and the smiling pot especially. You sure have a good eye. It's so nice when family can get together...lucky you. Thanks for my lovely bedtime story, if I'm allowed to call it that at my age! Always a pleasure to look at your fabulous photos and that you take time to explain each. I'm glad you've had some indoor winter treats! I am so very done with this crazy weather. Back and forth and back and forth. 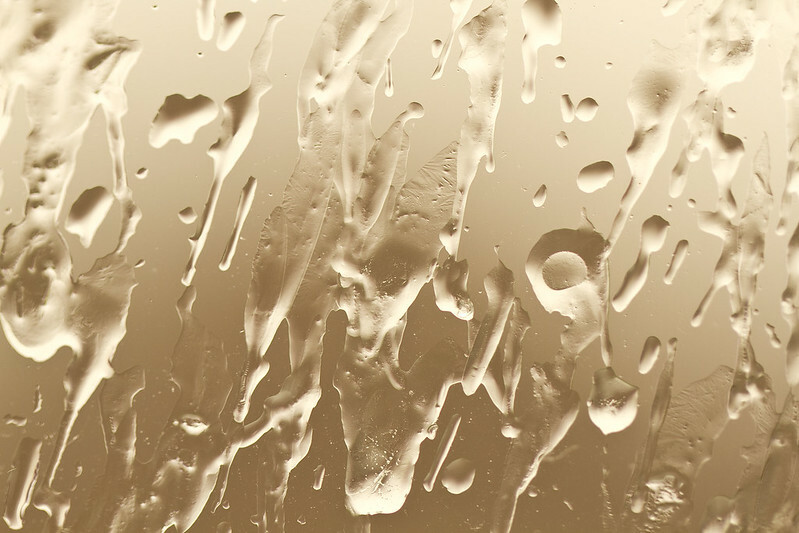 Rain and snow. Blah. However, it sure did make for some beautiful photos! 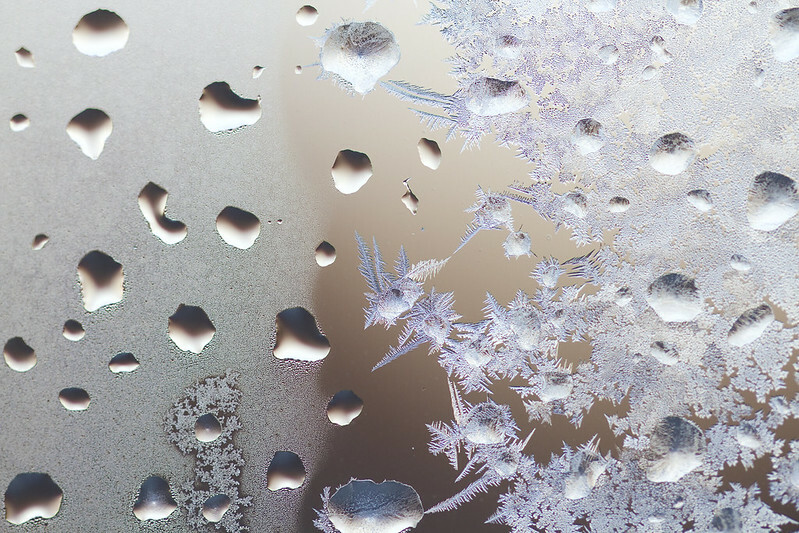 I LOVE the pics of the frozen rain on the window and the one of the rain next to the ice crystals. Amazing! How did that happen? Even your pot smiles at you! A sprinkle of snow here overnight and now rain. But I've been going to the 16 day concert... the LONGEST CONCERT WITH MULTIPLE PERFORMERS..... its an attempt to establish a Guinness World Record, and it's happening in the pub just down the street! Huge fun. And great music, see my blog!